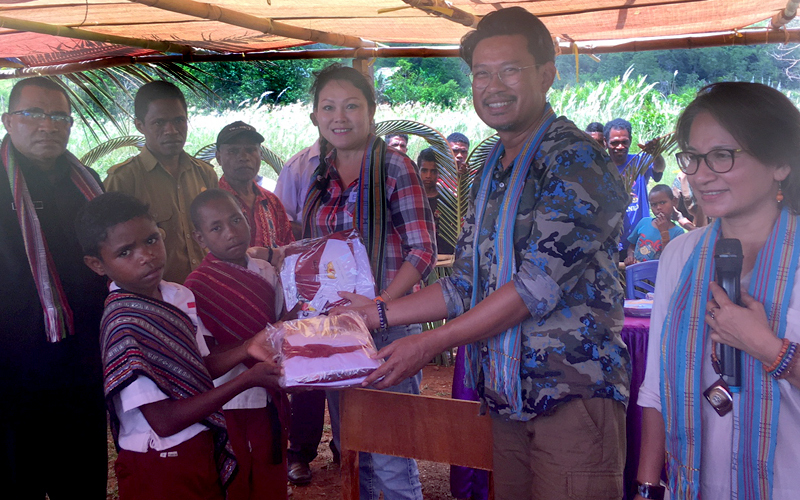 As part of our commitment to improve the welfare of the farming communities that partner with us, PMA held free medical services in two East Nusa Tenggara villages for one week in October 2018. 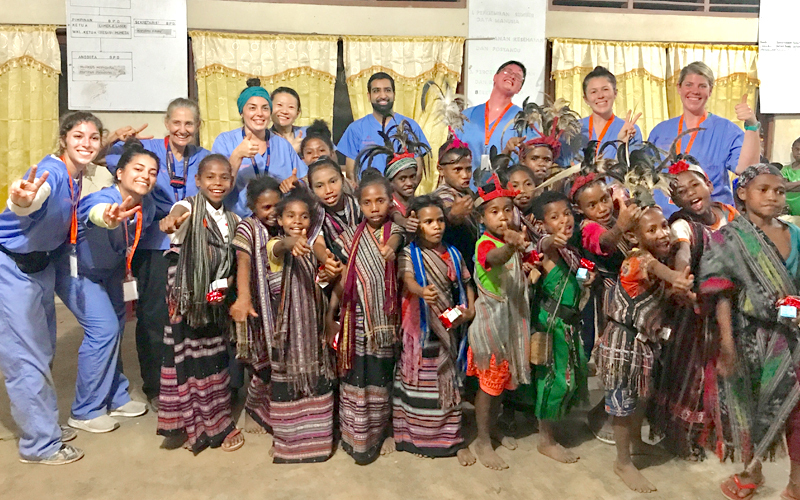 Located in Alor Island, one of the small islands in East Nusa Tenggara province, these villages have limited sources and infrastructure and there was no proper medical facility to serve the residents. The week-long medical charity was a collaboration of PMA and the teams from Medical Relief International and Hand Foundation, organizations that aim to help developing countries through providing proper healthcare. The medical teams consisted of general practitioners, dentists and other medical specialists. 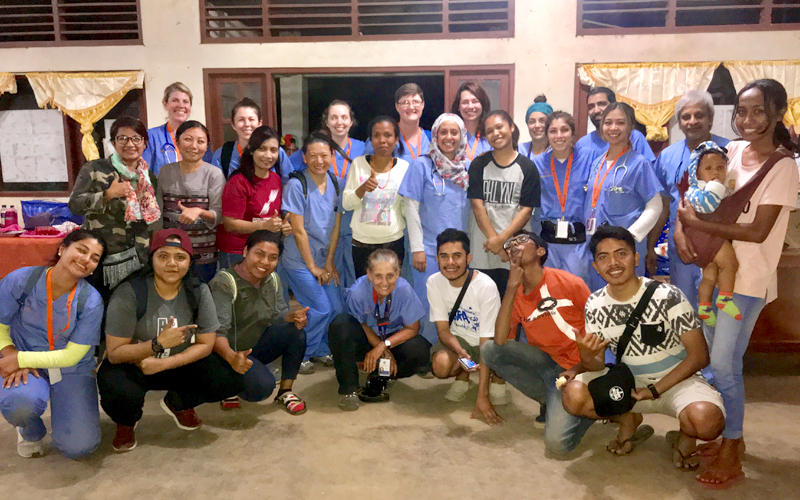 For seven days in two villages we served approximately 2000 villagers from all ages who received everything from general check-up, dental works, free medicines, radiology and lab tests, and even minor surgeries. This event was well received and appreciated not only by the communities we served, but also by the local government. PMA is looking forward to conduct other events and programs that will contribute to the increased well-being of these farmers and their families. In one of our earlier trips to a village in Alor Island in East Nusa Tenggara province, we saw something that broke our hearts. The village itself could only be reached by a 2-hour drive from the nearest city on a small road through hilly terrain, so this community was quite isolated and underdeveloped. 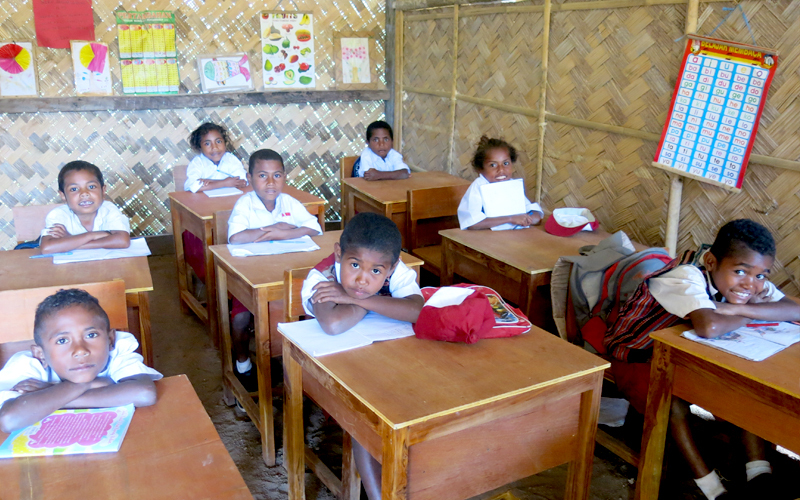 On that visit, we saw that the village’s only school building was nothing more than a simple structure of woven bamboo mats as walls, cracked hard dirt as floor, and filled with dilapidated desks and chairs. We learned that the original school building was destroyed by a tornado. An Indonesian NGO had stepped in to rebuild the school, and with the donation they collected they were able to build this humble replacement. Many of the students themselves didn’t have school supplies and proper uniforms. Some even went barefooted. Despite the poverty, the children themselves were still in bright spirits and were eager to learn. To welcome us, they performed a traditional dance called “Tari Lego Lego”, depicting the actions on a battlefield. The props (swords, bows, arrows, etc.) were handmade using natural resources. 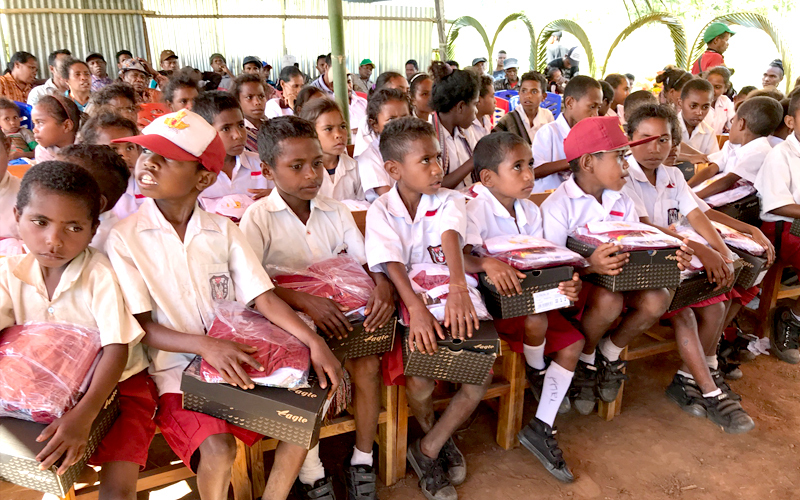 One of PMA’s core principles is to help improve the quality of life in farming communities, so we resolved to help these school children in this village. To accomplish that goal, in April 2018 PMA initiated a ‘student adoption’ charity program with the help of donors from Indonesia and other countries. Through this program we adopted all 50 students in that school and provide full scholarship, new uniforms, textbooks and school supplies. We also provide healthy food twice a month to improve their nutrition, as well as add extra compensation to the teachers. We also plan to build a new library for them. In addition to individual donors, we also have corporate ones such as Gramedia (Indonesia’s largest bookstore retailer) that supplied the books and Eagle (an Indonesian shoe brand) that donated shoes. 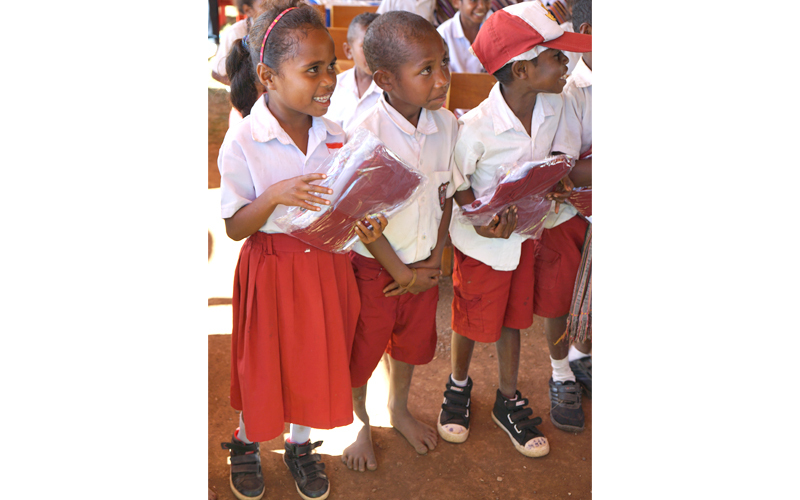 When we equip these children, we are building a better future for them, their families and their community. It’s a step that is still very rarely taken by the coconut sugar industry in Indonesia, but it’s a move that we took up because of our commitment to guarantee the safety of our food products: PMA has recently earned the British Retail Consortium (BRC) Global Standard for Food Safety certification for our Organic Coconut Sugar processing facility in Purwokerto, Central Java. BRC is a globally recognized authority in the industry, thus for PMA to be recognized with its certification is another assurance for our partners and consumers about our commitment to International Food Safety Standards. It contains requirements for food processors to follow to build an effective food safety management system. The requirements of the standard address the key elements that must be in place for the organization to ensure production of safe product. BRC Certification is recognized by Global Food Safety Initiative (GFSI), an important consideration when choosing a certification scheme because many major manufacturers and retailers require a GFSI-recognized certification. Other recognized certification schemes include SQF, IFS, FSSC, GLOBALG.A.P. and BAP and CanadaGAP. BRC standard has requirement for Senior Management Commitment, HACCP, Food Safety and Quality Management System, Site Standard, Product Control, Process Control and Personnel. Choosing Control Union as the certification body to certify our BRC Standard, PMA is proudly improving to comply with all BRC requirements.